The New Jersey Astronomy Center at Raritan Valley Community College has a new tool to help science teachers be better prepared to teach astronomy to their students. 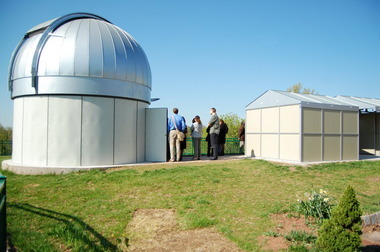 The new 3M Observatory at RVCC’s Branchburg campus officially opened Friday morning with a ribbon-cutting ceremony. The observatory is located next to the planetarium, which also serves as the astronomy center. Planetarium Director Jerry Vinski said there will be a lot of potential uses for the observatory but one of its main functions will be as a teaching aid. New Jersey recently adopted the Next Generation Science Standards, raising the expectations for science taught in schools. The observatory will help teachers be better prepared for the new standards, Vanderveen said. “There’s a lot of professional development needed for teachers and that’s why we try to provide,” Vanderveen said. 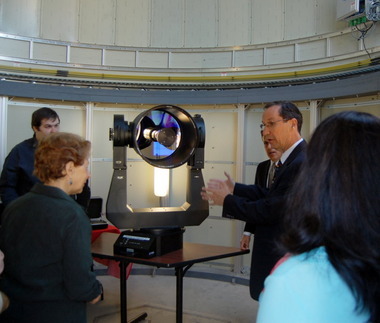 Jerry Vinski, director of the planetarium at Raritan Valley Community College, talks Friday about one of the telescopes at the new 3M Observatory at the college's New Jersey Astronomy Center. People tour the new 3M Observatory at Raritan Valley Community College Friday morning after a ribbon cutting ceremony opened the facility. The observatory contains three small buildings. At one end, a 16-foot dome houses a large telescope that will look through a rotatable opening in the ceiling. In the building closest to the planetarium, two telescopes were set up Friday under the building’s open 20-foot roll-off roof. When not in use for a workshop, Vinski said the observatory would be open to members of the RVCC astronomy club, the Somerset County 4-H Club as well as those who attend the planetarium’s weekly Saturday night shows. “We’re trying to have this open Saturday nights so families visiting can come and look through the telescopes,” Vinski said. The observatory is not open to the general public right now, but Vinski said he anticipates that changing. The $400,000 facility took nearly five years to complete. Besides the challenge of finding donors for the facility — $100,000 was donated by manufacturer 3M Co., based locally in Raritan Township — Vinski said the other big challenge was finding the right companies to build it. After a long search process and getting bids, a company from Illinois built the observatory. The rest of the funding came via private donations. Included in the donations was an anonymous donation of a pair of Oberwerk binoculars that are mounted outside the observatory. The telescopes at the facility are not new, but Bob Reichman, volunteer astronomer at RVCC, said the equipment was comparable to equipment in the Paul H. Robinson Observatory in Voohees State Park in Lebanon Township. No official first event has been scheduled for the observatory, though Vinski hoped there would be one in early July.